Do you usually use try to or try and? Did you know that this can be a controversial grammar topic? Some people would see sentence two as incorrect. Many grammar authorities agree that try and is an acceptable idiomatic form of try to, but it's still worth learning about the difference. Once you understand what's going on, you can make an educated decision about which you'd like to use. I'll show you how to diagram both sentences, and the diagrams will help you see why try and doesn't make sense when it is interpreted literally. Let's do this! I will try to remember his name. Here, we have will try acting as a verb phrase. Will is a helping verb, and try is a main verb. To remember his name is an infinitive phrase, and it is acting as the direct object of the verb try. The main thing to see here is that this formulation shows the flow of a single idea. The idea is one whole without being broken up. I will try and remember his name. In this sentence, will is still a helping verb, but now there are two main verbs. The word and is a conjunction joining the two verbs try and remember. In this sentence, there is a separation in the idea. The remembering is being broken apart from the trying. It's as if the person is doing the two things, and they are unrelated to each other. Using and separates the actions of trying and remembering. Now you can see why some people argue that try and doesn't make sense. When you interpret the words literally and you see the grammar of the sentence, it doesn't make sense. However, let's circle back to something I wrote earlier in this lesson: Try and is an idiomatic form of try to. What does that mean? Idioms are a type of informal language that have a meaning different from the meaning of the words in the expression. Idioms aren't meant to be read literally. 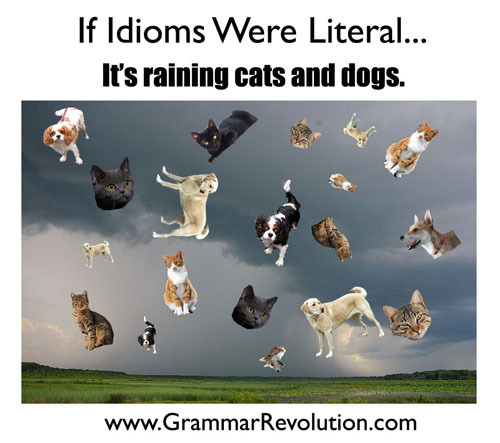 It's easy to understand that with idioms like It's raining cats and dogs. We all know that cats and dogs are not actually falling from the sky. The sentence means that it's raining hard. The same thing is happening when try and is described as an idiom for try to. The words are different, but they both mean the same thing. It's raining cats and dogs. = It's raining very hard. Which one should you use? I would suggest using try to in formal situations. If you have a hard time remembering which one is "correct," think of the fact that try and to both start with t, so they should be used together.